Taylorsville • Man sought in slaying was still at large late Friday. Magna • A resounding bang. A piercing scream. "Noooooo!" 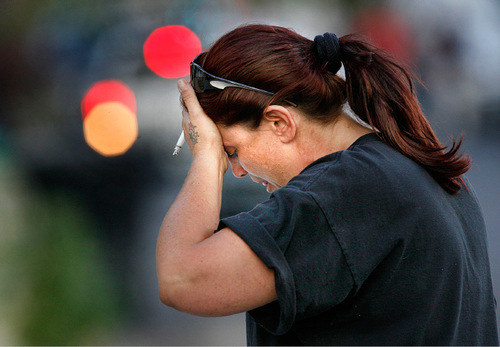 Christina Martinez shrieked as SWAT officers stormed into the home of her nephew, Steven Lee Sanchez, behind a flash-bang stun grenade. "Please. Oh, God, please! He doesn't deserve this!" Earlier Friday, police in Taylorsville had named the 31-year-old Magna man as a "person of interest" in their investigation into the Thursday night shooting death of 29-year-old Steven Norman. Martinez refused to believe that. "Not Stevie," she said as she and scores of other onlookers waited to see if Sanchez was hiding in his home. "Not him. Couldn't be him." Others in the neighborhood, two blocks west of Cyprus High School, say they're withholding judgment. All agreed that the man known simply as "Stevie" had been involved in gangs during his youth, but most said they believed he had left that in his past. Sanchez has a misdemeanor criminal history of guilty pleas to DUI, assault against a police officer and interfering with arrest. 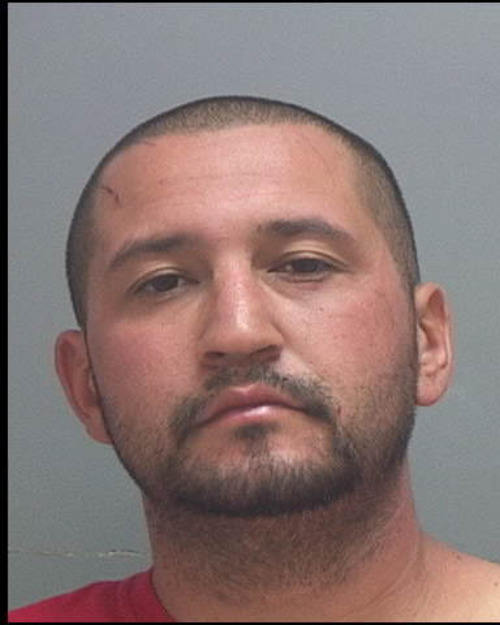 His most recent arrest dates back to 2003, according to Utah court records. But now, friends and family members said, Sanchez was the doting father of five children, a hard worker who had proudly bragged about being hired at Kennecott Utah Copper but who had recently been laid off. Neighbors said that several weeks ago Sanchez had been the victim of a shooting  having been struck in the jaw by a piece of buckshot in the attack  but Martinez said she had spoken to him several times since and she didn't suspect that he was interested in retaliation. Martinez said she last saw Sanchez early Friday morning  passed out on the sidewalk not far from his home, she said. There were police cars surrounding his home, so Martinez said she brought him "to a safe place." 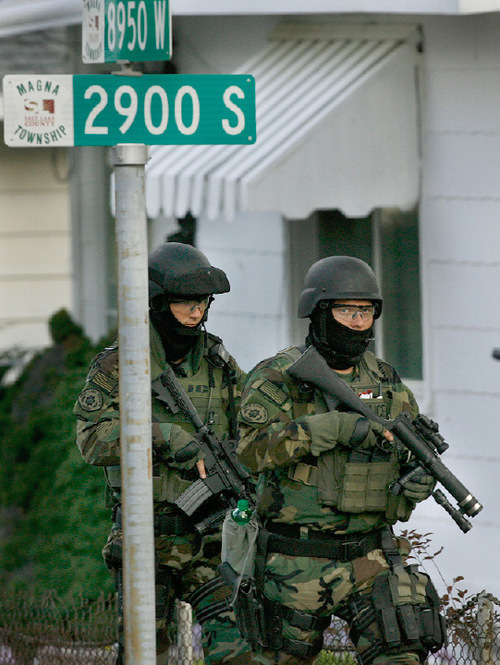 About a half-hour after SWAT officers in camouflage fatigues and body armor, armed with assault rifles, stormed Sanchez's home, a detective came to interview Martinez. 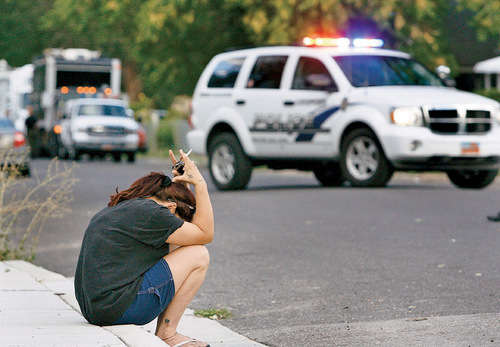 She left the officer's unmarked vehicle a few minutes later with her hands in the air. "He wasn't in there!" she cried. "Thank God! He wasn't in there!" Unified Police Department Lt. Don Hutson said that five adults and two children voluntarily left the home before SWAT officers moved in to see if Sanchez was hiding inside. Hutson said he was not certain whether fellow investigators in Taylorsville had yet secured an arrest warrant, but he said it would not be unreasonable to call Sanchez a "suspect" in the homicide. They had stormed the home in part, he said, because Sanchez's blue 1995 Chevrolet Tahoe  suspected to have been involved in the killing  had been spotted parked outside the house. Taylorsville police Sgt. Tracy Wynant said officers responded to multiple calls regarding a disturbance at a home in the 2200 West block of Heatherglen Drive (4400 South) about 10 p.m. Thursday. When they arrived, officers found Norman inside, dead. A neighbor said Norman had lived in the duplex for about two months with his wife and two children. Angel Ramirez, a friend of Norman's, exited the home Friday just before noon and made a brief statement to reporters. "He was a good person, he didn't deserve this," she said. Bob Mims and Lindsay Whitehurst contributed to this story.